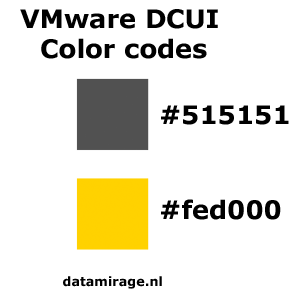 VMware DCUI color codes are recognizable by two primary colors, grey and yellow. Seeing these colors one knows you have entered the Direct Console. Our website is based on these trusty colors. Some technicians will know this. There are many ways to discover the codes. One way to discover the VMware DCUI color codes is to take a picture by camera. This will give you probably wrong information as the colors change taking a camera shot. We use Dell Server systems. Those systems have a great feature called ‘DRAC’. The ‘DRAC’ has a build in console feature which allows us to remotely open a console via TCP/IP and a Webbrowser. That’s the way I discovered those codes, just by make a screenshot with my Mac and use the eyedropper tool with ‘Photoshop’.